Sylvia the snail is in love with Simon Green, the gardener. She adores his luscious lettuce, choice cucumbers and buttery beans. And let's not get her started on his dandelion, cabbage and kale. There's only one problem. Simon Green is not at all impressed with his small admirer who nibbles holes in his produce! In fact, if she left his garden and never came back, he'd be happy. 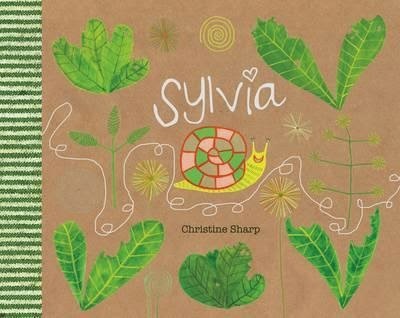 But Sylvia is a resilient snail, so she writes Simon a love letter in a shimmering snail trail down the garden path. A love letter that goes unseen as he stomps about searching for grubs. Sylvia refuses to be defeated. And with a flair for the dramatic, she makes an unforgettable declaration of her love at Simon's organic fruit and veg stall … with unexpected consequences! Christine Sharp is the creative spark who brought us Bea last year. With Sylvia she has returned with another zany, loveable character who's not afraid to be herself and stand out from the pack. Christine's graphic design training is evident once again in the beautiful design and layout, with text and illustrations bursting off the page in a gorgeously fun and vibrant explosion of colour and movement. Yes, there's also a message. Sustainable gardening and the delicious pleasures of fresh, organic produce are showcased, but with a light touch. (Who wouldn't want to eat cabbage when it looks as good as this?) And I simply have to mention how enjoyable this book is to read aloud due to an absolutely amazingly awesome abundance of alliteration!